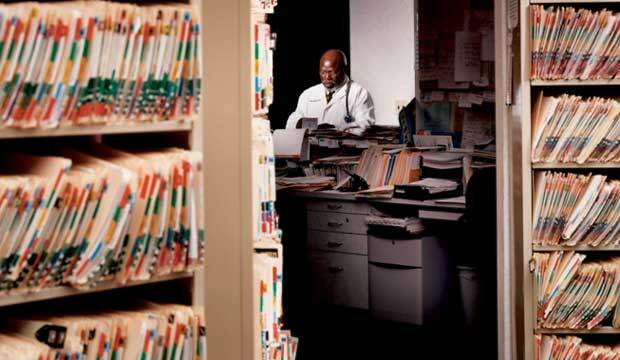 Track dozens of performance measures // Sift through hundreds of patient records // Swallow thousands of dollars in overhead costs—when all they want is to deliver better care. Most physicians like to think they’re taking good care of their patients while also running efficient businesses. Louisville family practitioner A. O’tayo Lalude is no exception. Two years ago, when Lalude heard about a project designed to develop “best practices” in diabetes care, he volunteered. The program, sponsored by Center for Studying Health System Change (HSC) in Washington, D.C., reported that physician attitudes about P4P in 12 health-care markets range from skeptical to hostile. Witness the slow response to the Physician Voluntary Reporting Program, sponsored by the Centers for Medicare & Medicaid Services (CMS). Launched this past spring, the program includes a “starter set” of 16 quality measures—from documenting whether a heart attack patient is given aspirin upon arriving at the treatment site to checking an elderly patient’s history of falls—that are intended to introduce physicians to simple goals while more sophisticated measurements are being developed. Around 2% of physicians who routinely bill Medicare have signed on. And while Nancy Wilson, joint senior adviser to CMS and the Agency for Healthcare Research and Quality in Rockville, Md., expects participation to pick up, she understands why most doctors are holding back. “It isn’t clear that we’ve been able to accurately portray physician performance from a quality or efficiency standpoint,” she says. Many doctors would put it less delicately. After decades of calls by bureaucrats to standardize medical methods—what critics have termed cookbook medicine—physicians are leery of these latest efforts, which often seem to have more to do with containing costs than with ensuring quality. Many, for example, think the tracking process adds costs without clear benefits to doctors or their patients. Yet Congress, fearing a future in which Medicare devours an ever larger share of the federal budget, is tired of waiting for consensus. A bill introduced last year could make performance measures permanent and require mandatory compliance. “Once Medicare gets into the game, that will be the game,” says Hoangmai Pham, a physician and senior health researcher at HSC. Pham notes that Medicare influences the entire health system, with virtually every commercial insurer following the government program’s lead. She predicts that if Medicare adopts P4P, choosing not to participate may cease to be an option for most physicians. 1.“Early Experience With Pay-for-Performance: From Concept to Practice,” by Meredith Rosenthal et al., Journal of the American Medical Association, Oct. 12, 2005. One of the first published studies on the subject, focusing on lessons to be learned. 2.Performance Measurement: Accelerating Improvement, by the Institute of Medicine, National Academies Press, 2006. Landmark analysis that recommends standardizing performance measures and other strategies for adopting pay for performance nationally. 3.“Large Employers’ New Strategies in Health Care,” by Robert Galvin and Arnold Milstein, New England Journal of Medicine, Sept. 19, 2002. Informative article that explains programs under way at companies with 10,000 or more employees. 4.“The Unintended Consequences of Publicly Reporting Quality Information,” by Rachel M. Werner and David A. Asch, Journal of the American Medical Association, March 9, 2005. A thorough analysis of the potential limitations of health-care report cards for improving quality of medical care.